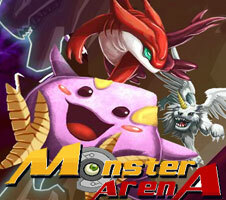 Monster Arena is a new one-on-one battle game where pick and train your loyal monster. Read more details for Monster Arena. Welcome in the world of monster! Train and befriend with your own monster and teach him valuable power, defense, agility and intelligence skills. Praise, train, and battle with nearby monsters who wandered into your neighborhood. Make your way up into the monster tournament and become the ultimate monster trainer. Welcome in the world of monster! - Choose your type of monster, whether it tough, agile, and other! - Choose your monster class, from mage, assassin, and other! - Battle over dozens of trainers! - Develop your monster status and their abilities! - Explore the Monster Arena world! My monster is lv 20 almost, the game is pretty fun. i like how i can customize the way my monster can use and obatian their abilities!